WELCOME TO GOLF IN THE GREATER SARASOTA & BRADENTON AREA! 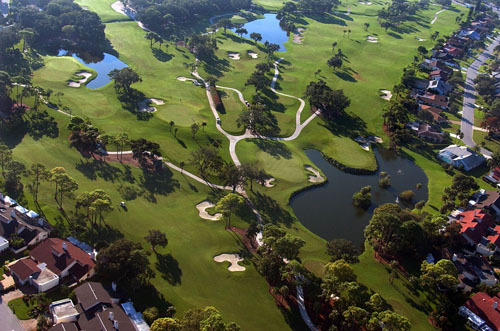 Along with the beaches, the Greater Sarasota area boasts a verdant and tropical playground that offers tennis, lawn bowling, croquet, water skiing, cultural events, restaurants, museums, state parks, operas, ballets, university classes, and of course golf at more than 100 public, semi-private and private golf clubs. Known as Florida's "Cradle of Golf", downtown Sarasota lays claim to the first course in the state and one of America's first golf courses. Built in 1905 by Sir John Hamilton Gillespie, a Scottish colonist, the nine-hole course is commemorated today at the intersections of Golf, Links and Gillespie Streets. So come experience Sarasota’s rich golf and cultural history, challenge some course records or establish some of your own! Long regarded for its historical place in the annals of Sarasota golf history, Bent Tree Country Club is blending the old with the new as it embarks on a major club renovation project beginning April, 2007. 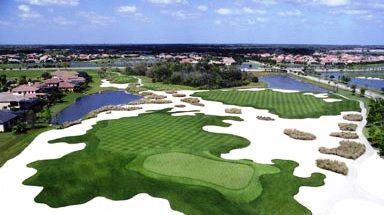 After 31 years full of history and tradition that includes hosting thirteen consecutive LPGA Sarasota Classic professional tournaments (1976-1988), seven consecutive Florida State High School Championships (1980-1986), and multiple U.S. Open qualifiers, Bent Tree will undergo what some may consider an Extreme Country Club Makeover. Sarasota's only municipal golf facility with 45 holes of great golf fun & challenges. Play the American Course (18 holes, par-71) and the British Course (18 holes, par-72) for the challenge or the 9-hole, par-30 Gillespie Executive for the fun! The restaurant and lounge is open daily for breakfast and lunch, with full bar. Call 365-GOLF anytime day or night up to five days in advance to reserve your tee time on our 24-HOUR TELE-TEE electronic service. This quiet neighborhood is nestled between lakes, nature preserve areas and the outstanding Azinger/Lewis 18-hole championship golf course. The 27-hole championship golf course at the Heron Creek Golf & Country Club in North Port pro-vides a unique and enjoyable golfing experience in Southwest Florida. Designed by famed architect Arthur Hills, Heron Creek is a superb, natural design that not only preserves, but enhances its natural surroundings. Highlighting the unique features of the landscape and native plants, Heron Creek has rolling hills, large stands of oak, pine and palmetto, spectacular water features and many native birds. Elevated tees assist the golfer with shot placement and the sloping greens are meticulously maintained. The course design challenges golfers at every skill level, but without intimidation. The Learning Center is the largest and finest practice facility in the area. Rated 4-1/2 stars by Golf Digest, Heron Creek has the variety, beauty and course conditioning that will make you want to play it again and again. IMG Academies Golf and Country Club at El Conquistador has long been regarded as the most unique and challenging golf course in the region. Following a $2.5 million renovation, IMGA delivers a golf experience that is challenging yet rewarding, serene yet exhilarating. There is no other course like it in Southwest Florida. Measuring 6855 yards, IMG Academies Golf and Country Club is considered the region’s most playable, scenic and technically advanced golf course. There is more than just great golf. Members enjoy world class dining in the main clubhouse overlooking beautiful Sarasota Bay. Social functions are planned throughout the year. Laurel Oak is Sarasota’s premier private golf and country club, with two Gary Player-designed golf courses that present challenges and rewards to golfers of all skill levels. If you haven’t challenged an award- winning Arnold Palmer-designed course, then wait no longer to make your tee time at Legacy Golf Club. Managed by Troon Golf®, this upscale, 18-hole championship daily fee course, is different from anything found in the region. Legacy features elevated multiple tees, natural wetlands and virtually every hole is framed with sand and water. Not only is this course more than memorable, but a round of golf at this impressive facility comes with a guaranteed level of service you would only expect at a world-class private club. Celebrating it’s 10th Anniversary, Legacy is pleased to share it’s success by offering special discounts on all non-sale merchandise all year long. Plus, you’ll find impressive savings at the club’s website with monthly internet-only Anniversary Specials. Legacy was voted among the Best Places to Play by readers of Golf Digest and given 4-1/2 stars for 2006-2007. Plus it was rated One of America’s Top Golf Courses by ZAGAT Survey 2006-2007. Come join Misty Creek, a private, member-owned club limited to only 300 Equity Memberships, where you can always get a tee time. Other memberships include an Intermediate Membership (Ages 22-40) for young professionals, Corporate Memberships, Social and Seasonal Memberships. 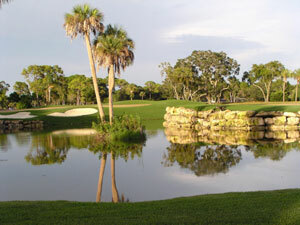 Misty Creek is Sarasota's only private country club built in a nature preserve. Home to bald eagles, deer, bobcat, alligators, wild boar and countless birds, it's a 6,895 yard championship track with fairways that are bordered by dense forest and lakes that will make you pause on every shot and appreciate the genius of the course design. For Membership information call 941 922-2188. Tee times 941 921-5258. Website at www.mistycreek.net. Welcome to Sarasota’s only country club. The term “country club” began in the developmental stages of golf in America. The game of golf was a retreat to the country, away from the city and urban sprawl. Designers used the raw terrain and natural setting of the land by carving the fairways from the trees. The club is a family owned and operated facility, OPEN TO THE PUBLIC. It is located away from downtown for a reason: How many 850-acre nature preserves are located downtown? Oak Ford’s 27 holes of quality golf are graced by live oaks and palms teeming with wildlife. Please phone the golf shop for current fees and to reserve a starting time. To book online visit our Web site: www.oakfordgolfclub.com. A little out of the way - a lot out of the ordinary. Palm-Aire is Florida’s legendary private member-owned Equity Club, providing a number of recreational and social alternatives to a distinguished membership, conveniently located between Bradenton and Sarasota, near Lockwood Ridge Road off University Parkway. Residency is not a requirement for membership. Walk in the footsteps of golfing legends on our unique Champions course, where “Shell’s Wonderful World of Golf” was hosted—the first national program of televised golf. The Lakes, designed by Joe Lee, opened in 1982. Enjoy 36 holes of newly renovated fairways featuring luxurious greens, manicured to perfection. A complete pro shop managed by Head Golf Professional Steve Yates offers top-of-the-line merchandise and private or group lessons for all levels of players. Championship golf is just the beginning at Pelican Pointe Golf & Country Club. This 27-hole semi-private course winds through nature preserves and lakes, offering the golfer glimpses of a number of different birds and wildlife. Every hole presents an invitation to test their skills. Over the past eighteen years River Run Golf Links has established itself as one of the Gulf Coast's most popular municipal golf courses. 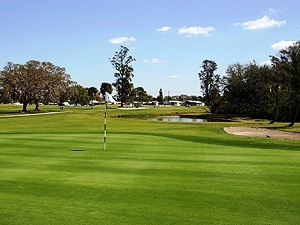 This mainstay of the Bradenton golf scene is known for it’s unique combination of affordable and challenging golf. The City of Bradenton made a commitment to ensure the popularity of the course by undertaking an extensive renovation of the facility. The course closed for six months to transform the layout from tee to green. The new recreational facility designed by local course architect Jed Azinger opened for play in November 2005. This reborn 18-hole, par-70 layout offers a wide variety of challenges for players of all ages and experience levels. Every tee, fairway, and green is laid out to specifically enhance your enjoyment of the game. The transformation included all new tif-dwarf greens and 419 bermuda grass tees. All of the green complexes have been redesigned for better playability and in some cases the new configuration has added a bit more of a challenge. For the big hitters, approximately 300 yards has been added to the championship tees, while still preserving a par of 70. Amenities include a fully stocked pro shop and snack bar. Rental clubs are also available. River Run Golf Links caters to outing and tournament groups, accommodating from 24 to 144 players. Golf instruction is also available from our in-house golf professionals who are dedicated to provide quality, service, value and a personal touch. Tee times may be reserved up to 7 days in advance Tuesday through Sunday. 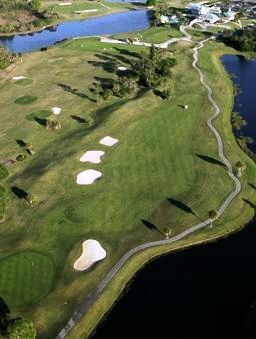 River Run Golf Links is conveniently located on 27th Street East, 1/2 mile South of SR 64 in Bradenton. (Take I-75 exit 220 - West, just 3 miles to 27th Street East). A privately-owned golf club that is open to the public, Rolling Green is conveniently located to downtown Sarasota and the beaches. Rolling Green features an 18-hole, par-72 course situated on 175 acres. This public course is regarded by many as one of Sarasota’s favorites. The course boasts generous fairways and large manicured greens for an experience that golfers of all levels can appreciate. The course is known for its friendly staff and good conditions at reasonable rates. Amenities include a driving range, golf shop, putting green and practice bunker. The restaurant opens at 6 a.m. daily for breakfast and lunch, and the full service lounge is a local favorite. Tee times are available seven days in advance. Proper golf attire required. One of the most challenging and best maintained courses on the Suncoast, this harmonious blend of manicured greens and magnificent natural surroundings will keep your game in excellent form. State-of-the-art facilities and a full-service pro shop staffed by PGA professionals combined with outstanding lighted Har-Tru tennis courts, junior olympic pool and fitness center make this the most desirable of country club lifestyles. A family-friendly facility, Sarasota Golf Club is a championship course that winds through mature trees in a very natural Florida setting. Sarasota Golf Club has undergone extensive renovation in recent years, including large new greens and resurfaced golf cart paths. The club features a full practice range, a complete pro shop, and an informal grill room that offers some of the friendliest service in Sarasota. Serenoa is one of the finest 18-hole championship golf courses on the Gulf Coast. Florida Golf News has named Serenoa one of the top 100 golf courses in Florida and one of the top three courses in the Sarasota area. As expected at any top-rated facility, Serenoa is accompanied by a first-class practice facility, restaurant, a friendly, courteous staff and a pro shop stocked with quality name brands at discounted prices. This Ted McAnlis-designed links course has preserved wetlands and eleven lakes in a natural setting. Experience our best-ever course conditions due to extensive renovations. New Bermuda Tif dwarf greens make putting fantastic. Plenty of wildlife and nature at its finest! The signature hole is the 504-yard, par-5 13th, a dogleg right, over water. Amenities include a fully stocked pro shop, courteous staff and restaurant serving breakfast and lunch, plus a phone on the ninth tee to order food at the turn. There is also an on-course beverage cart. A large practice facility offers grass tees, chipping from grass and traps and an 18-hole putting green. Lessons are available with our PGA Pro by appointment. Proper golf attire required. No tank tops, tee shirts or cutoffs. Soft spikes only. Club rentals are available. Call for tee times up to seven days in advance. On-line reservations can be made 24/7 on our website: www.tatumridgegolflinks.com. This is a unique opportunity to play a classic Arthur Hills-designed 18-hole, par-65 course in the intimate setting of the private Meadows Country Club. It is a shot-makers layout, featuring lush undulating fairways, beautiful old oaks and perfectly manicured greens. The Groves is the only walking course at a private club on the Gulf Coast that is open to the public. Whether you walk, ride or simply experience the ambiance, the Groves is a course for everyone. The Meadows Country Club is the only private member-owned club in the Sarasota area with three individually designed 18-hole golf courses - 54 challenging holes of golf! The Meadows course was recently renovated by renowned architect Ron Garl and is one of the best championship courses in Sarasota. The Highlands course is a par-72 and The Groves is a unique walking course designed by Arthur Hills. Each is beautifully manicured and maintained. For membership information, call 941-378-5957 or 371-6000. Members of The Oaks Club enjoy Two Championship Courses, The Eagle and The Heron, with scenic views and spectacular elevation changes for a superior playing experience. These courses challenge highly skilled players, yet remain playable for golfers of all skill levels. In 2007, The Club completed a full renovation of the Eagle Course by world-renowned course architect, Arthur Hills. The Golf Program is one of the finest in the Southeast. The Preserve Golf Club at Tara features Ted McAnlis' newest par-72, championship golf course. Exceptional care was taken to protect and enhance wetlands and other natural features of the course. At just over 7,000 yards, the course offers four sets of tees: the Hummingbird, Heron, Hawk and Eagle. This allows players of all skill levels to enjoy a challenging round of golf. Eleven bridges span the many small streams running through the golf course, protecting natural waterfalls and wetland habitats. A unique feature is the 60-foot Mount Matthew, which sits between the driving zones of holes five and six and forms an impressive backdrop for the tee shot. Lessons are available by PGA professionals. Measuring over 7000 yards from the back tees, The River Club is considered one of the more challenging layouts in the area. Two distinctive nines incorporate rolling fairways with plenty of mounding on the front and dense woods with undulating, rolling greens on the back. To add to the playability, this summer the Ron Garl-designed 18-hole championship course has incorporated all new state-of-the-art Jones Dwarf greens. A semi-private country club, The River Club is open to the public seven days a week. Memberships are available. The restaurant offers panoramic views of the golf course and is open daily for breakfast, lunch and Friday night dinners. Other amenities include a full-service pro shop, lessons, driving range, tennis courts, pool, lounge and banquet facilities. Tee times are available two days in advance and proper golf attire is required. Set in a beautiful oak hammock The Woodlands offers something for golfers of every skill level. Forgiving from the front tees and a challenge for the best golfers from the back tees, this outstanding 18 hole, par 60 course is complimented by a practice range with grass tees, two putting greens, and a pro-shop & snack bar. Private and group lessons are available. "Not your typical short course." University Park Country Club continues to receive the acclaim of players as the Club completes its four year revitalizatin project. Consistenly rated 4+stars by Golf Digest since 1996, it is hardly surprising that the 27-hole, Ron Garl designed Championship Course is a sought after venue. The course is the centerpiece of an award-winning residential community with amenities such as Park Grille & Cafe Restaurant, the Tennis and Fitness Cetnre with 11 lighted Har-Tru tennis courts, croquet, lawn bowling and one of the finest practe-driving range facilities in the area. Some may consider it a stroke of genius. This Audubon International 18-hole, par-72 masterpiece unveils the premier golf experience for the Sarasota area. With more than 660 acres of the 1,039-acre span devoted to open spaces, it would be tempting to play the course based solely on the view. However, the course provides much more, with challenging holes, water hazards, grass hollows and wide fairways. Renowned course architect Chip Powell took his design inspiration from the early masters including Ross, Tillinghast and MacKenzie, offering players the opportunity to play golf “the way it was meant to be played.” With five sets of tees and a span of nearly 7,000 yards, Venetian is designed to accommodate even the longest hitters. Strategy, thoughtfulness and shot-making skills are far more important than strength alone here. Executive golf at its finest! This 18-hole, par-58 layout keeps golf fun for the novice, but provides a good test for advanced golfers. Players may walk or ride anytime. A great place to learn the game, with two Class-A golf professionals available to offer instruction to all abilities. Built on an orange grove in the 1960s, this traditional golf course is a part of Sarasota history. A tasty menu can be found in the restaurant, along with a full bar. Tee times available up to three days in advance. Designed by Ted McAnlis, Waterford’s 27 holes have distinct, picturesque qualities. 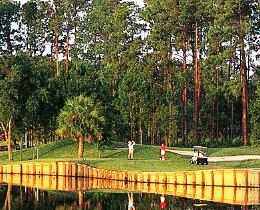 Each nine-hole course possesses natural Florida landscape and a variety of wildlife. Come challenge our course record, currently 65 held by PGA Tour player Paul Azinger and our head golf professional, Jack McFaul. Lessons are available from McFaul, named “Golf Professional of the Year’ and Teacher of the Year” numerous times by the Southwest Chapter of the North Florida PGA, and Charlie Darbyshire, Assistant Match Play Champion two years standing and Stroke Play Champion for the year 2000. Inspired by the backdrop of the Manatee River, the ultimate golf experience has been created with the perfect combination of beauty and challenge. Imagine a golf course with four unforgettable holes that touch and border the scenic Manatee River. Waterlefe Golf & River Club’s design uniquely blends land and water with stately oaks, vistas of the Manatee River and surrounding marshes. This course features gently sloped greens with the newest Tif Eagle Bermuda grass for the ultimate in putting. From a lazy start on the par-5 first to the big finish on the 18th hole island green, golfers will delight in this naturally beautiful course.